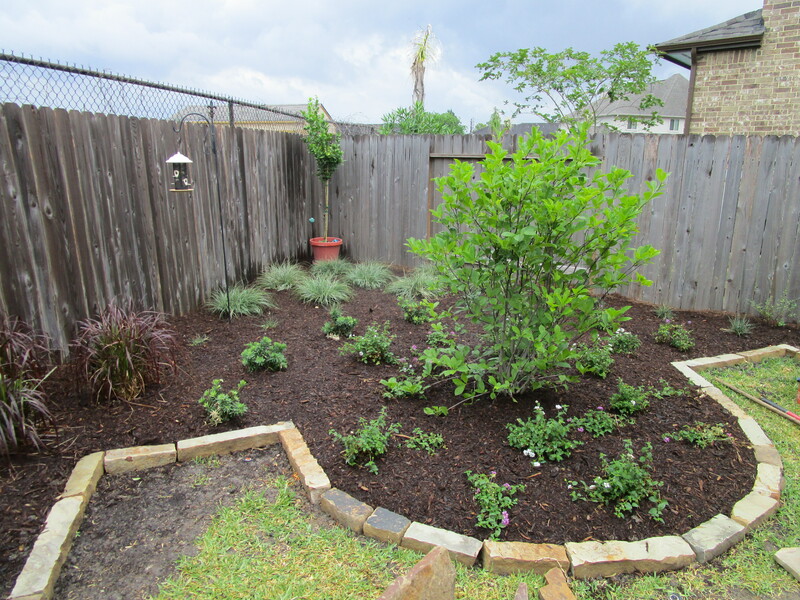 Out in the Dairy Ashford area of Houston, where lot sizes are bigger, we had plenty of room to create a naturalist back yard retreat. You may have wondered if we do larger gardens. We do but often we just do the design and not the install. 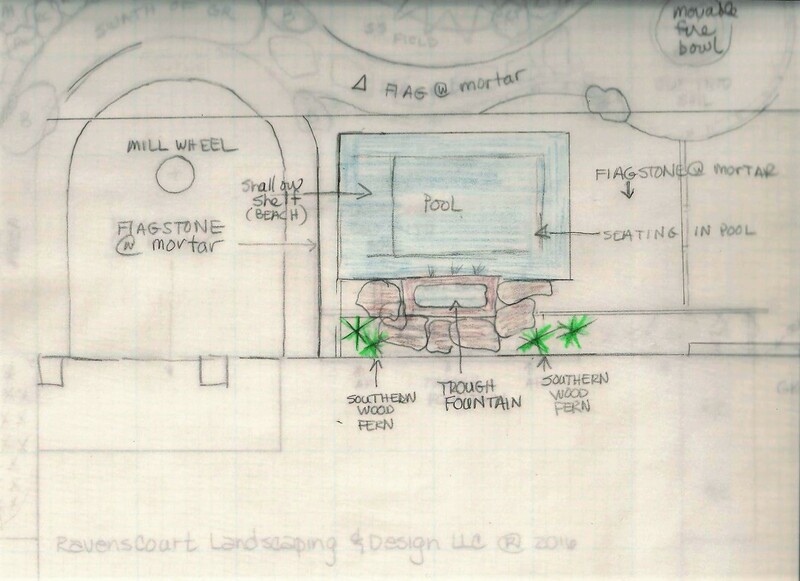 This project was in the design phase when the young couple decided they wanted a pool. The utility easement constrained where they could build. In the end they went with a spa/pool called a “spool”, a new word in my vocabulary. Here are a couple of before shots of the blank slate we started with. 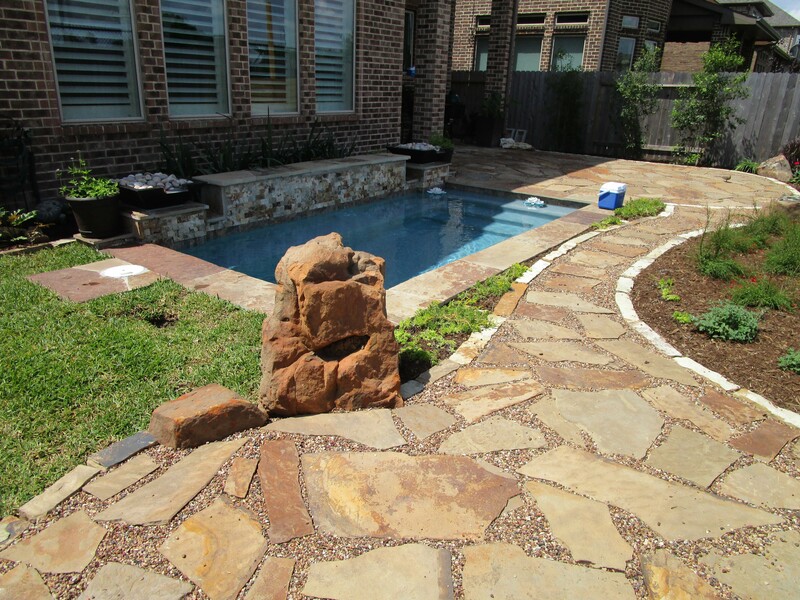 Originally the design had a water feature near a large patio. 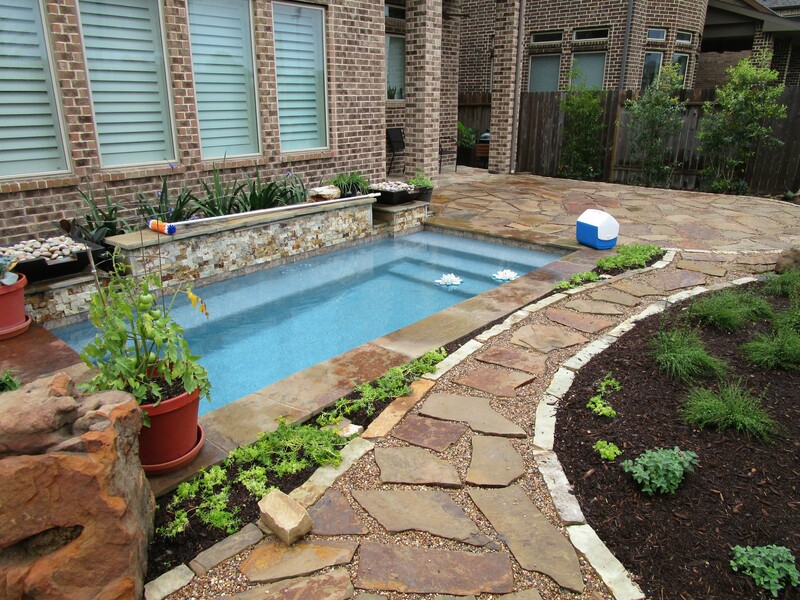 Placing the pool took several passes with various shapes from kidney to rectangular. 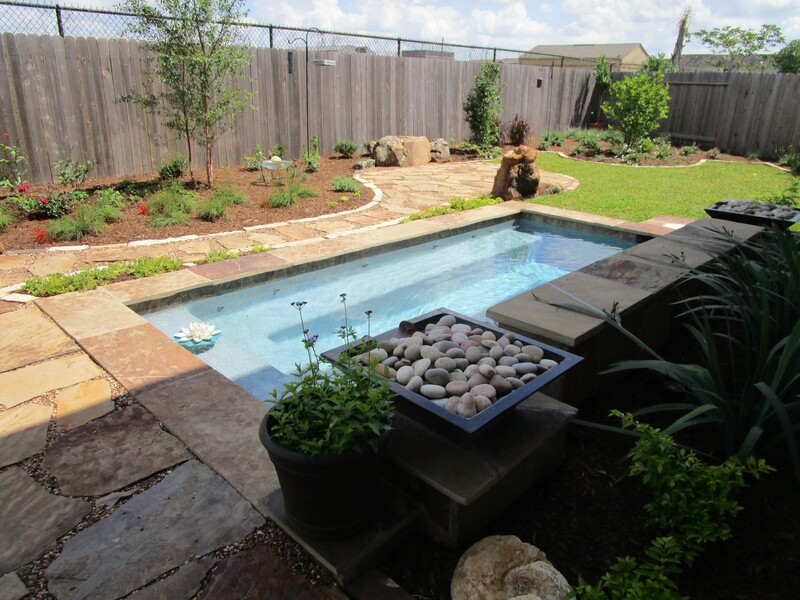 We consulted during the pool planning phase on size, shape and placement of the pool while the couple also got ideas from various pool companies. I suggested a rectangle nestled up to the house similar to the original design. 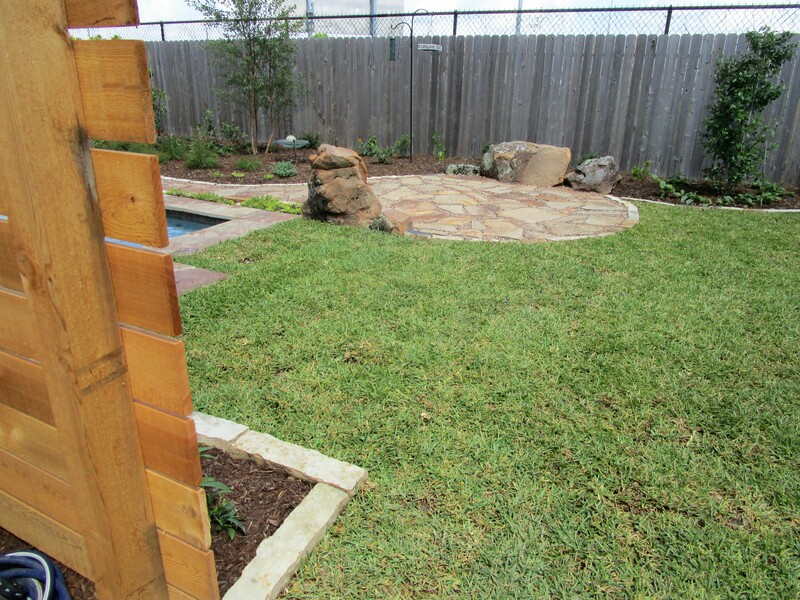 In the end the water-feature was eliminated and fountains added to the pool itself. We do not install pools so we left that part to another company. We came back when the spool was completed. 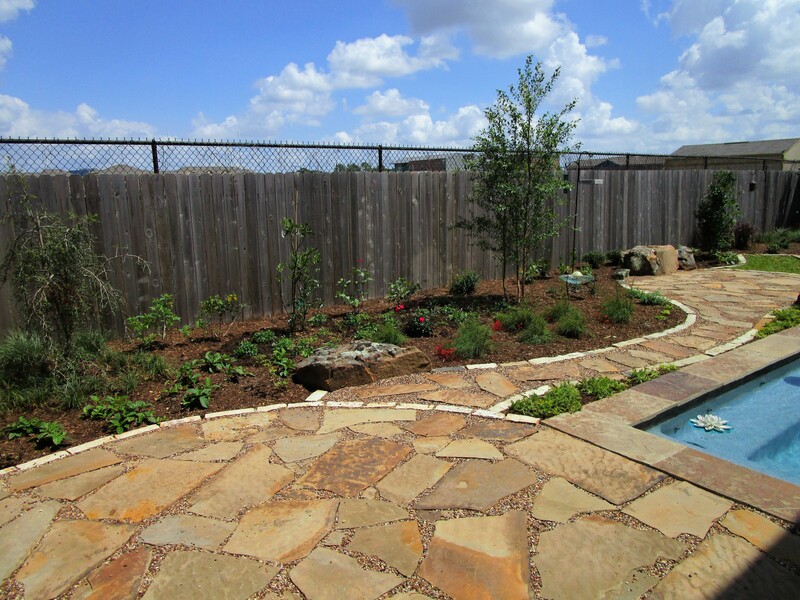 We started with the irrigation and then installed the hardscape and plantings, etc.. Here it is! The blue ice chest was left out daily during the installation, full of water for the crew, by the very considerate homeowner. Tucked up next to the house and easily available from the back door means this pool, that can be warmed in winter and refreshing in summer, is going to get plenty of use. There are two waterfalls that will help block out the noise of surrounding environment and sooth their souls after a long day at work! 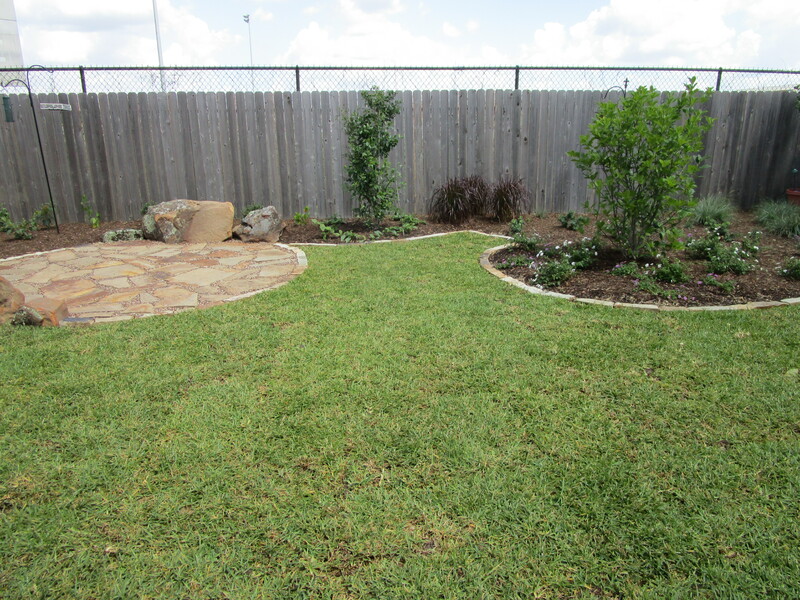 The plants are designed to attracted wildlife and give a sense of being out in nature. Mixed in are roses a favorite of the client and a special one from her Grandmother. 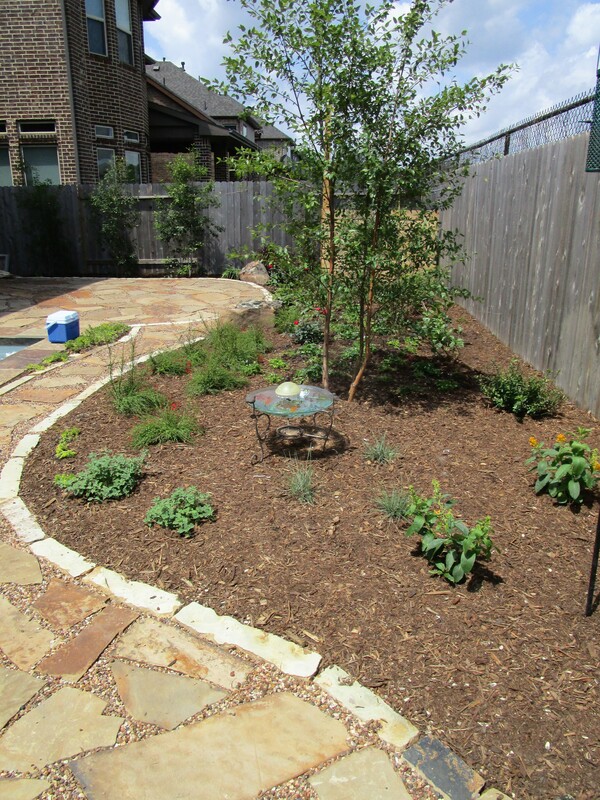 The couple’s desire is to attract birds, bees and butterflies to their garden. 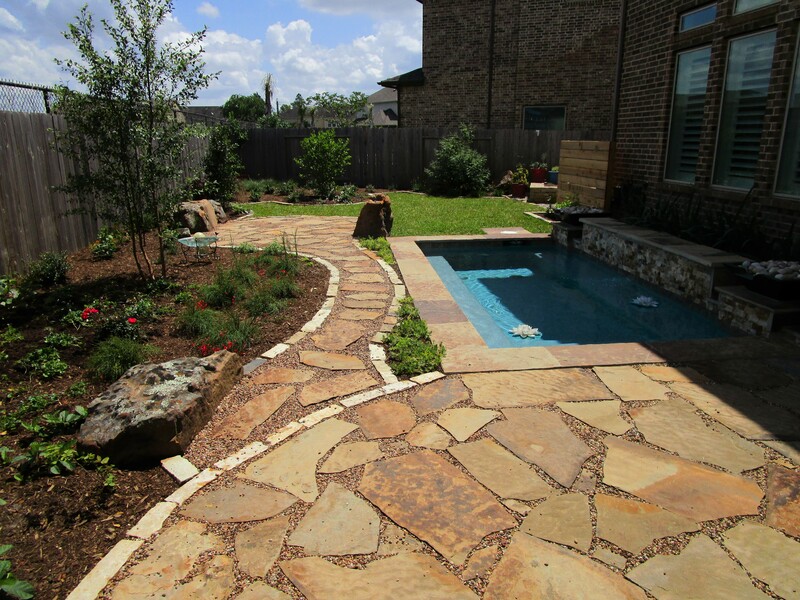 We installed a large patio to the west of the pool and right off the little covered area outside the back door. There are windows across the back of the house and over time as the plants grow in you will be able to see several layers of green. 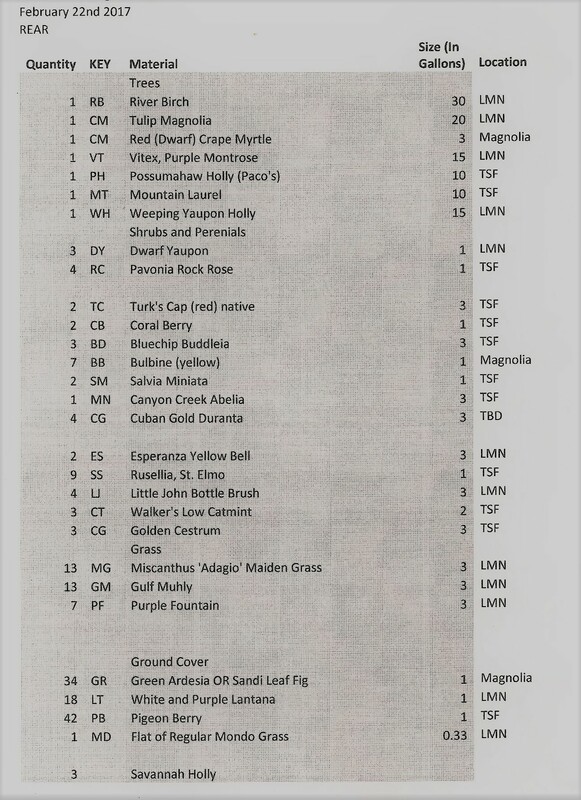 (Scroll to end for a complete plant list). We got a text the other day saying they found a baby cotton tail hiding in the garden. I guess the word is out that wildlife are welcome here. Beside the large patio we planted a row of Savannah hollies, Ilex x attenuata ‘Savannah’. These trees are very hardy and grow moderately fast with adequate sun light. Here they will create more privacy as they get taller. They are drought tolerant, take shearing, mostly allergy free, native to the southern USA and the berries will attract birds. 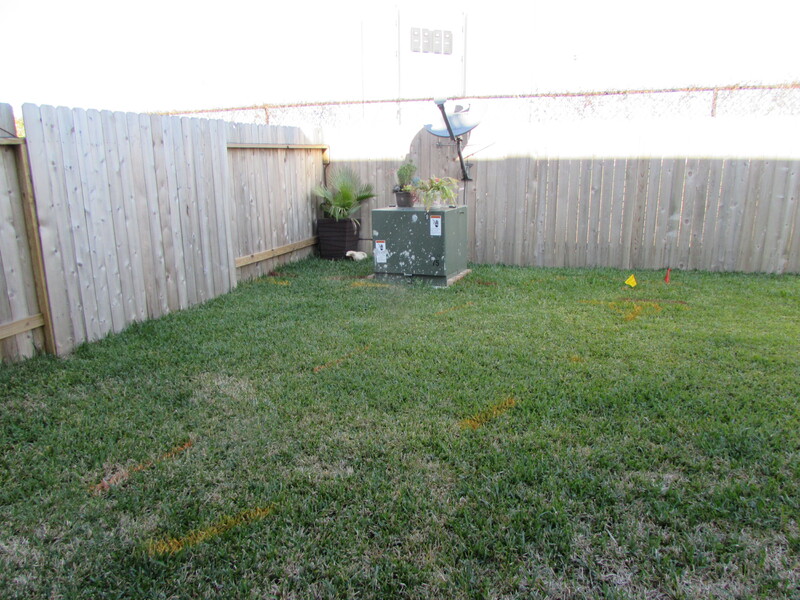 We created matching screens to hide the pool equipment and A/C units on the side yard and the telecommunications in this corner. You might be wondering why we left one post very tall. That is for installing string lights. 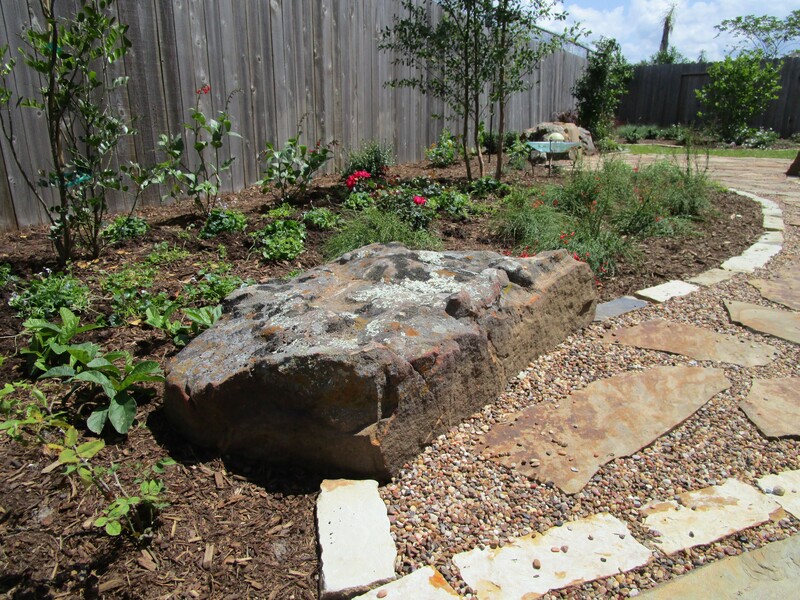 Throughout the landscape we have added boulders for visual interest, texture and a naturalistic feel. Some where chosen because they are flat enough to sit on. As this landscape grows in it will become more beautiful and the plants will be more in balance with the stone work. But even newly planted it is very appealing don’t you think? 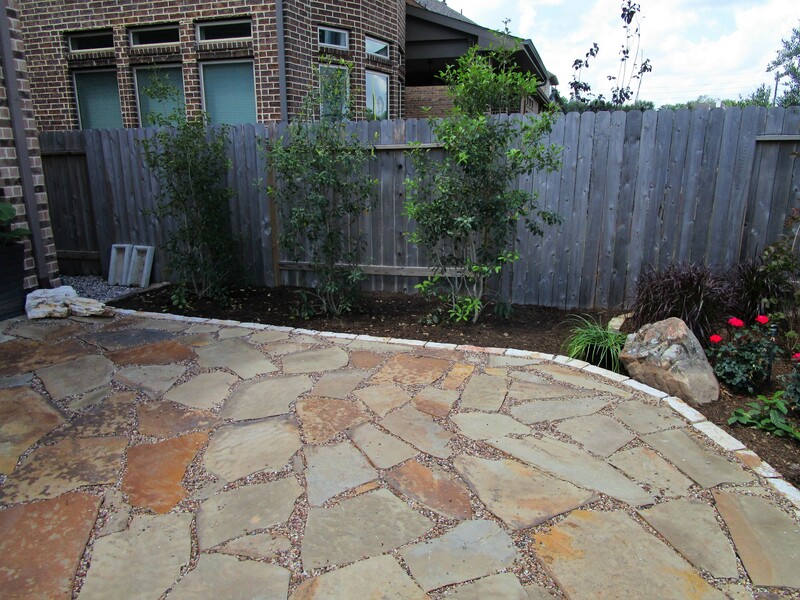 The path leads to a smaller patio that is designed to have a fire ring to sit around. Tucked to the right you see the other screen. 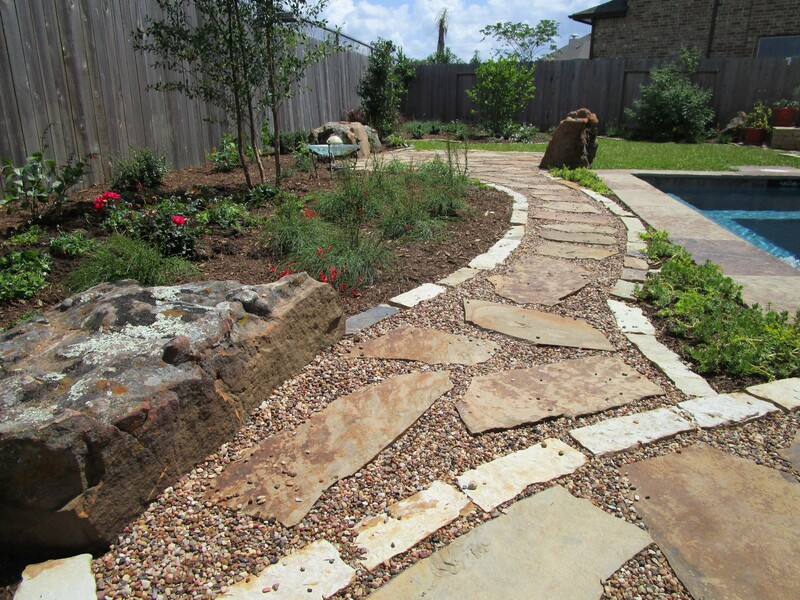 The path is also doubling as a bed border and in time as the plants grow in there is plenty of room for them to spill over the edges. 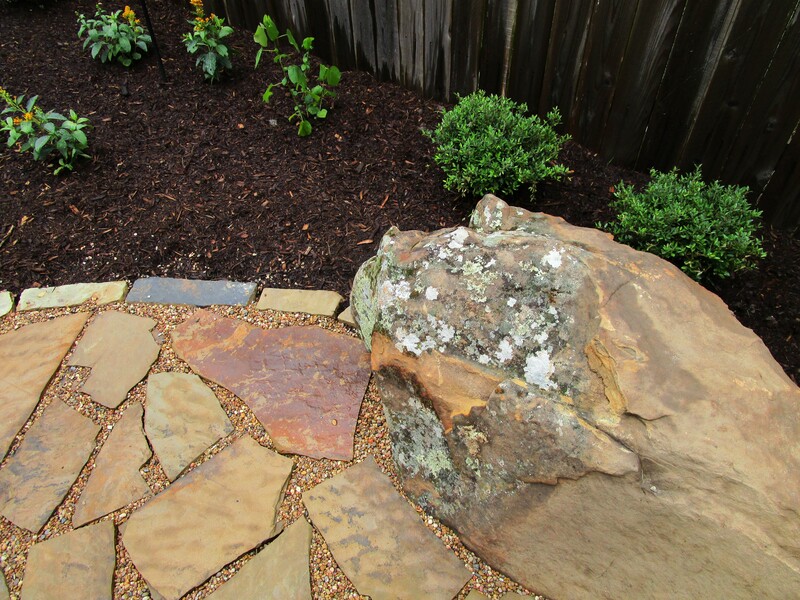 Have to show you a close up of this cool mossy boulder that is just right for sitting! I believe there should be several places to sit or gather in a garden. You have different sun and shade options this way and if you have a larger gathering not everyone has to be in one space. I love the presence that rocks add. They are natural sculptures in a garden. Here are a couple of shots looking back to the west from the small patio. The Dura Heat® River Birch, Betula nigra ‘BNMTF’ is the biggest tree we planted; or will be. This variety does very well in Houston. Sadly we often see them planted in flower beds hitting the roof soffit. They really do need room to spread out and grow tall. I used it here to add to the woodland feel. I also enjoy the sound its leaves make when they sway in the breeze. Taken from the path looking west. Between us and the screen is a Weeping Yaupon Holly and closer to us a Texas Mountain Laurel. These are both considered small trees that are attractive with seasonal changes but will never out grow the space. 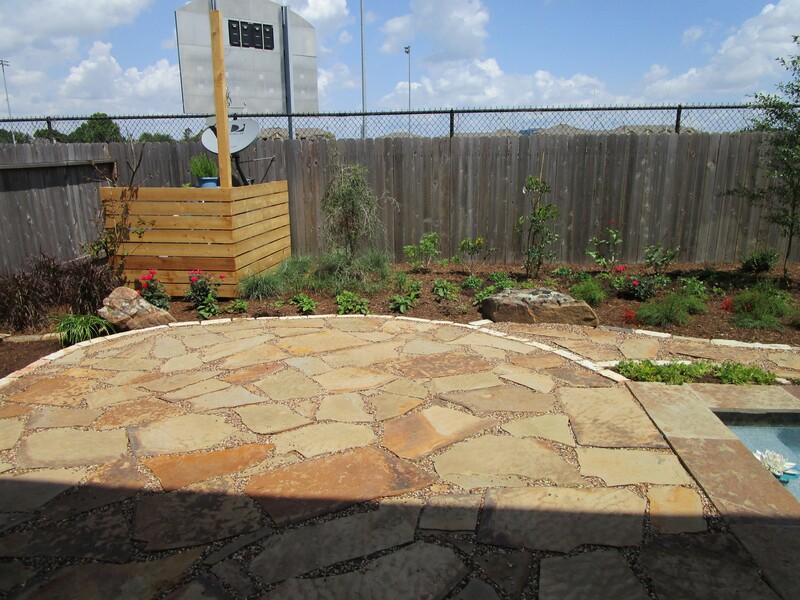 Stepping back a bit we can give you at the fire ring circle look from the vegetable garden area. The screen here is to block the view of the pool equipment and A/C units. This angle looking to the east corner. 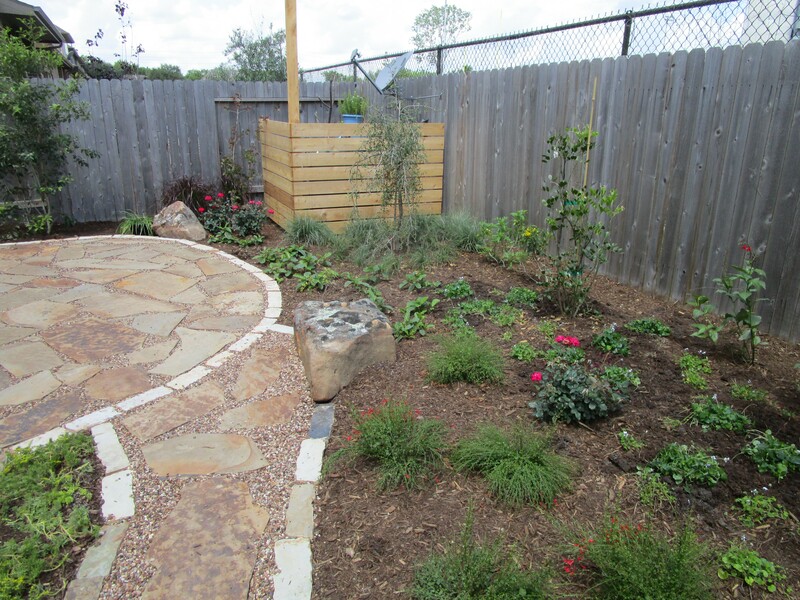 In this far corner we placed pollinator attracting plants in mass surrounding a focal tree. Originally it was going to be a Natchez Crape myrtle, until the homeowner saw a Saucer magnolia in bloom : ) Saucer Magnolia, Tulip Tree,Magnolia x soulangeana. There are several grasses. The grass in the background is Miscanthus “Adagio” Maiden grass that will fill in and obscure the fence. 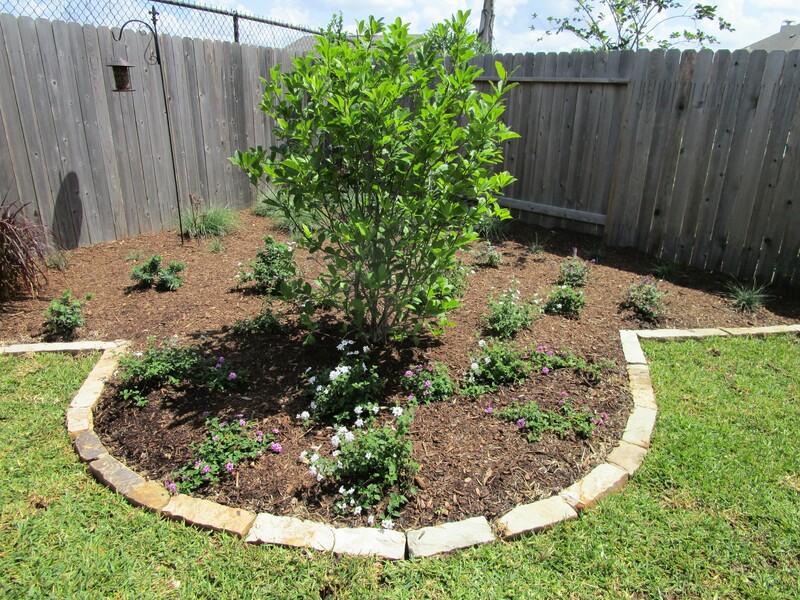 Around the tree we have Purple and White Trailing lantana that will be in bloom for nearly 9 months here in Houston. Another view from the veggie garden/ utility area. 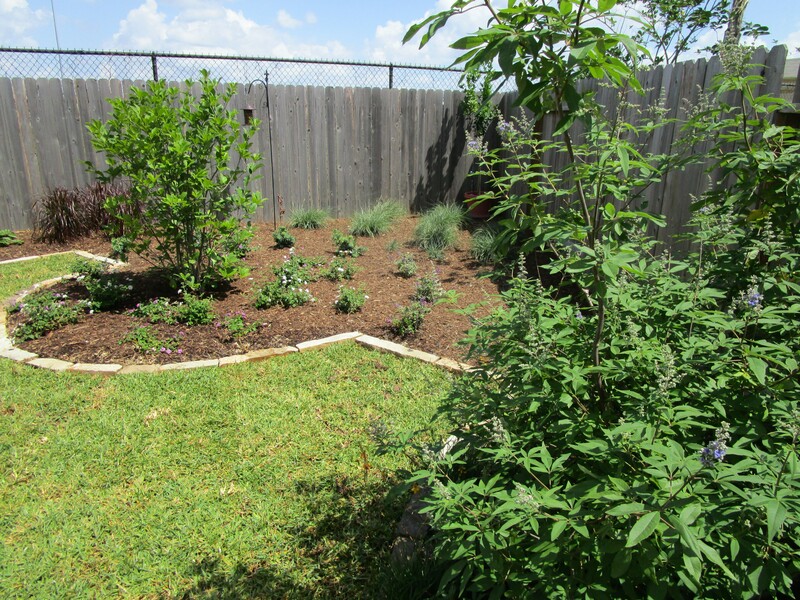 On the right is a Purple Montrose Vitex. We have one in our garden that is a favorite of our Cardinals. For more photos check out Treesearch Farms FB page. 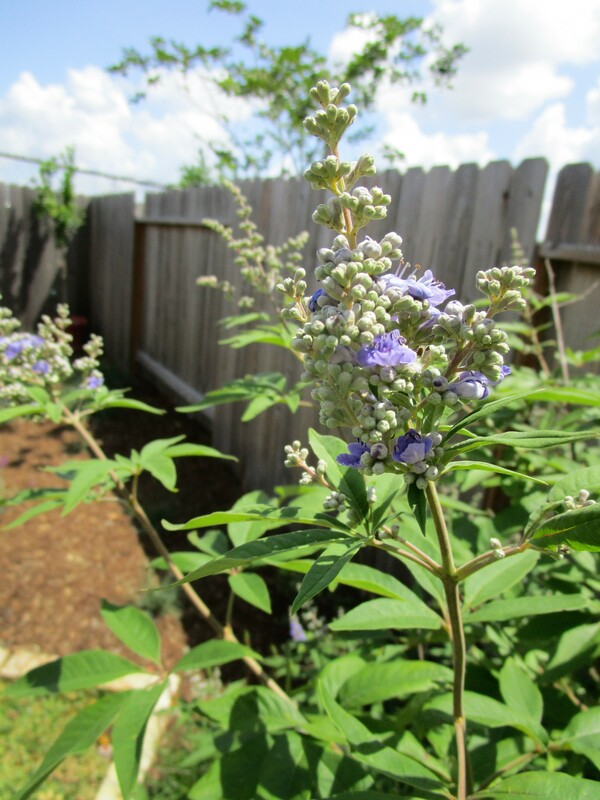 Close up of the cool Vitex flowers just beginning to bloom. 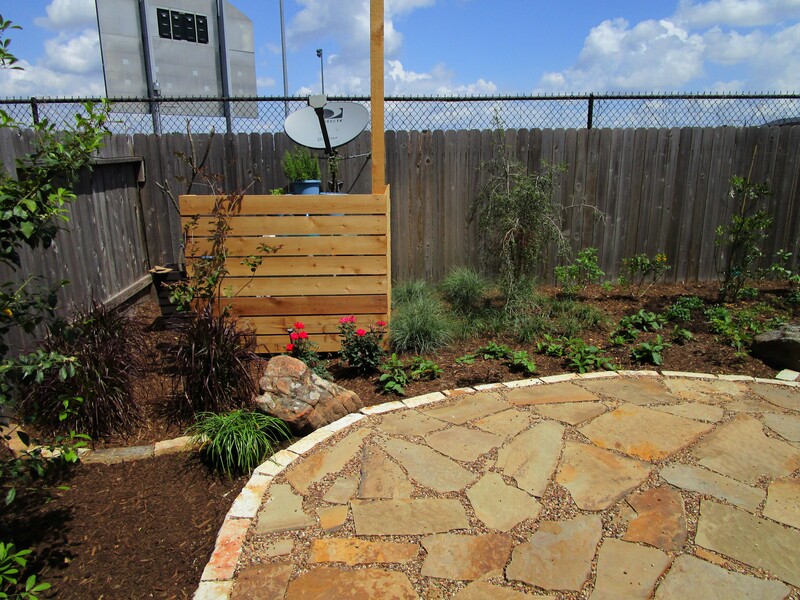 The pie shaped of the lot means plenty of side yard. 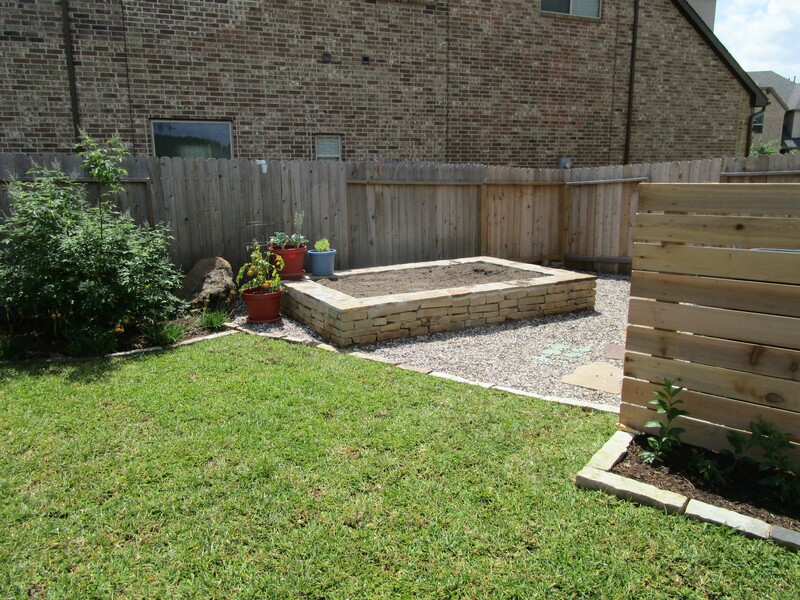 This gave us room for a large raised vegetable garden. 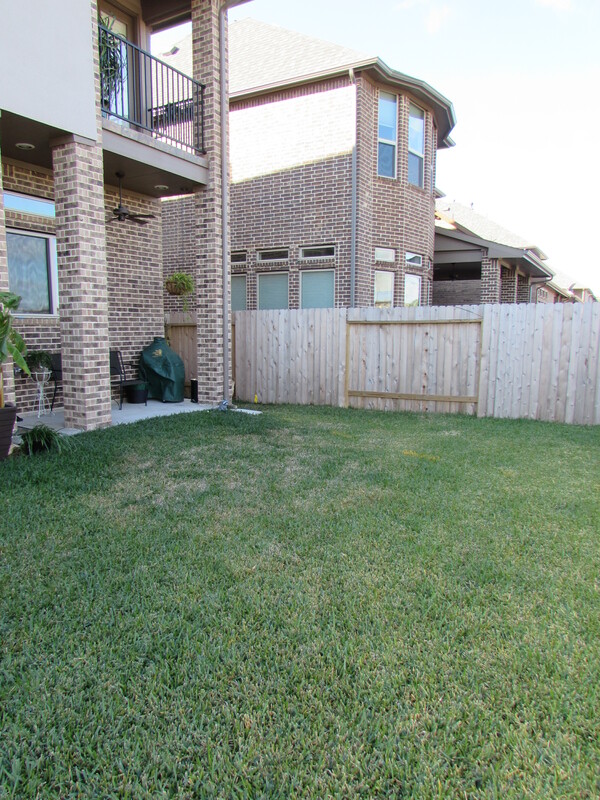 The empty corner is for a garden shed that has not been purchased yet. 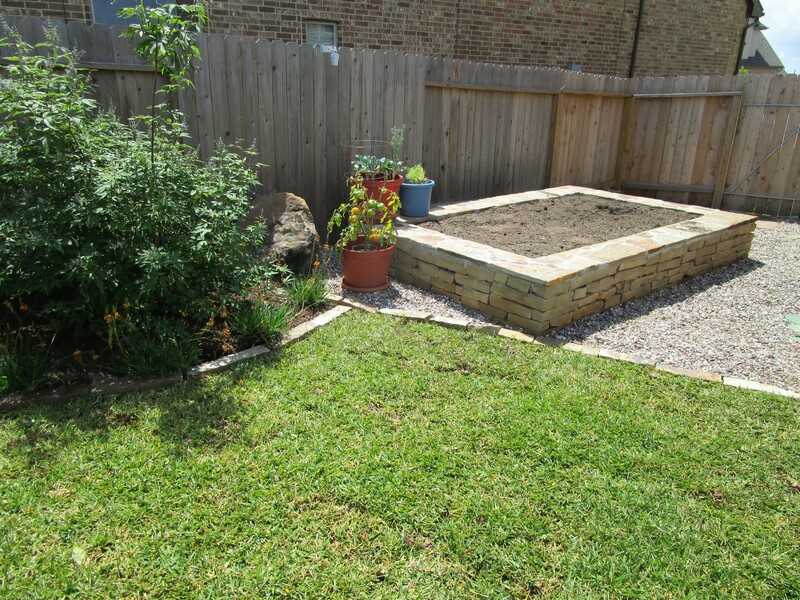 We used the same chop-stone that is edging the path and patios to create a matching facade on this large raised bed. 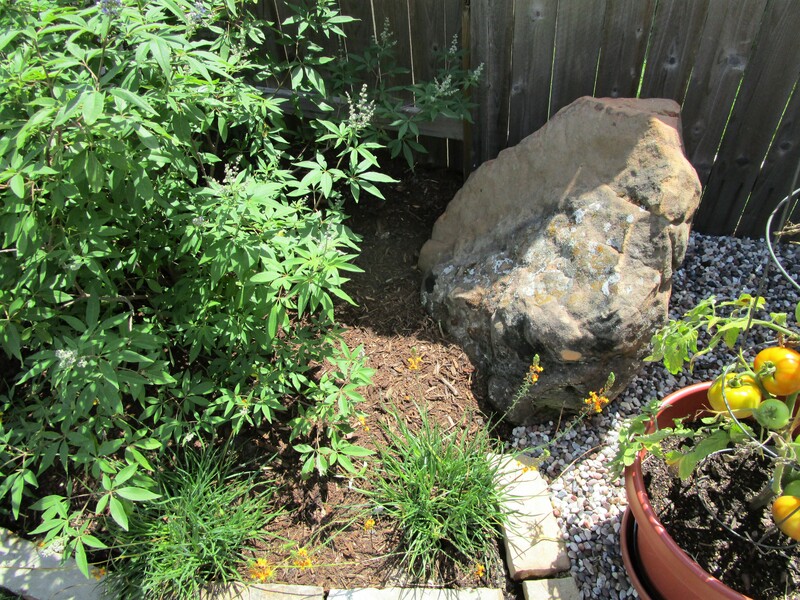 The bed is about 16″ high and designed so you can sit down and plant or weed. 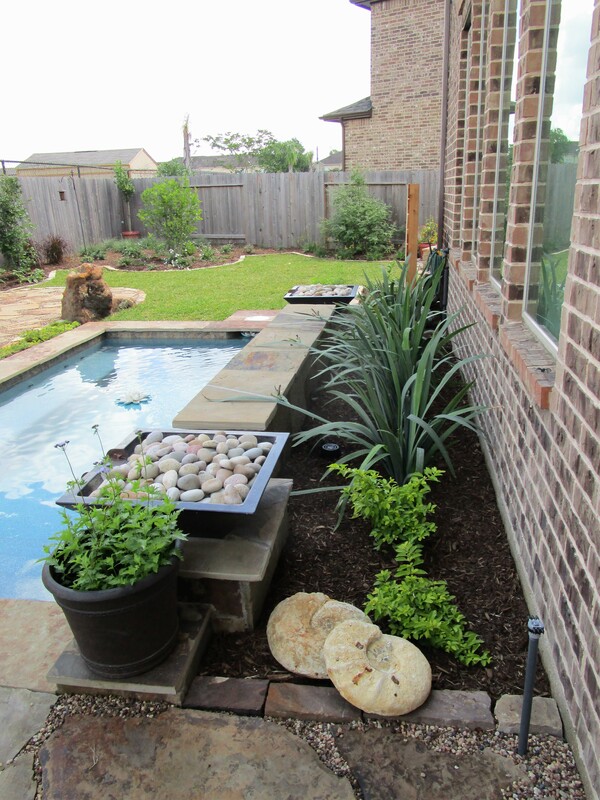 I love the trend of creating a place to grow herbs and vegetables. There is nothing like fresh food! Below another little boulder tucked in just for fun! Wrapping up this great space with one last look at the stairs inviting us down into the “SPOOL”! 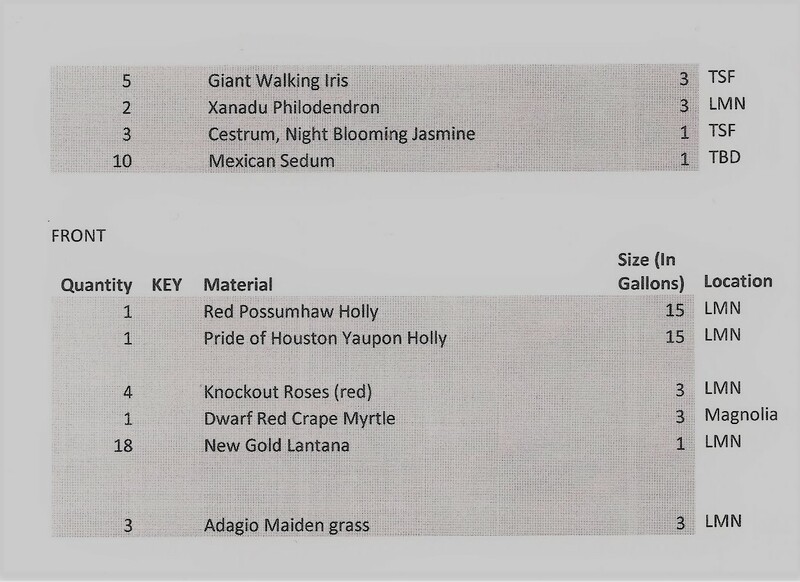 Complete Plant list including other side of gate and front garden. Lauren, that landscape is already lovely but it will be spectacular when it’s mature! Thank you Cindy! I hope they will send photos. This couple actually want to garden and she comes from a family of gardeners. I really enjoyed the spirit and drive! You guys are geniuses! 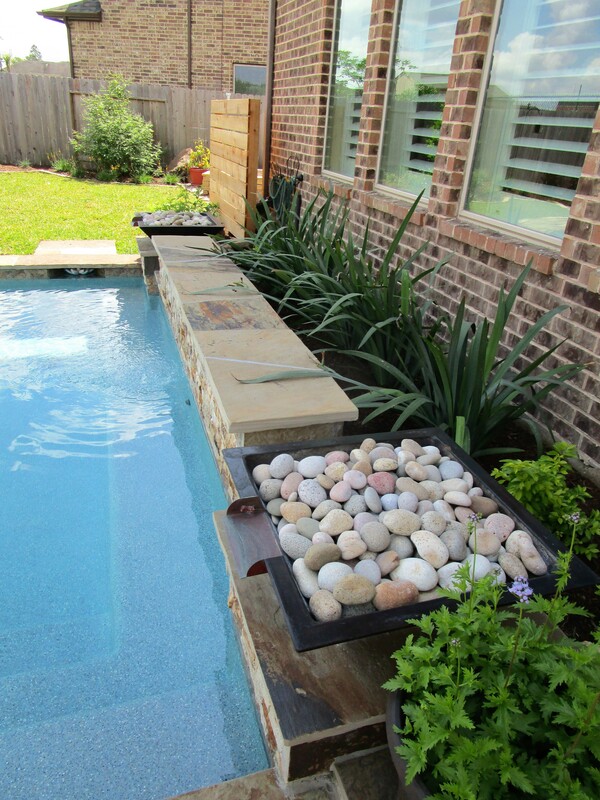 I really like that pool, and the design of the entire project is the way I would want it–earthy and warm, but contemporary, too. I like the idea of a spool. It looks so inviting! If I lived in a warm climate year-round, I think I would have one. That’s great you added the plant list on the post – I need to do that some. Your initial design and it being refined is good to show. The spool – I’ve never hear the term but have seen those, very good with the shells. 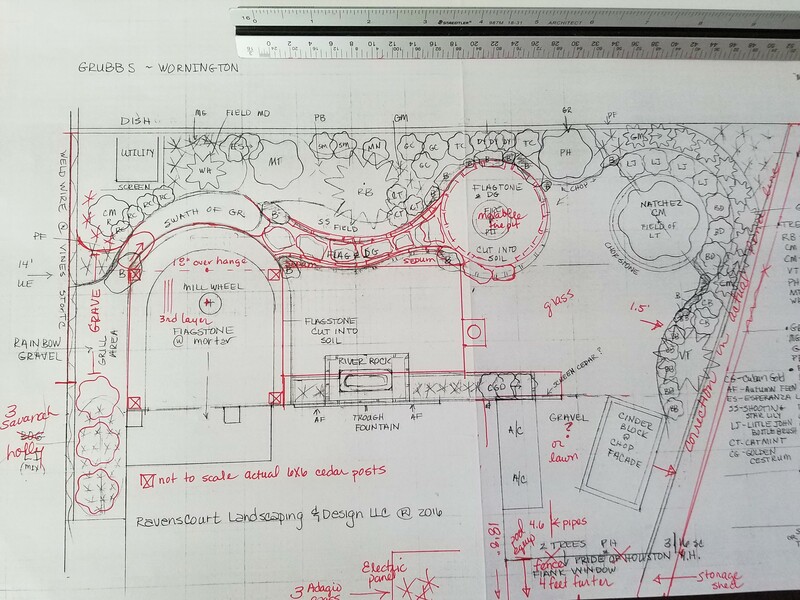 Thank you for the feed back including plant list and design evolution. I should have included the kidney shape with naturalistic waterfall picture that was an option. I felt it was too contrived. I am looking forward to the plants growing in!